You walk on the vault of heaven (Job 22:14) and on the wings of the wind (Psalm 104:3). Yet, You say that you will also walk among your people… be their God and take them to be your people (Leviticus 26:12). You walked in the Garden of Eden in the cool of the day, pursuing man who had fallen into sin, rebellion and the clutches of the enemy. Enoch of old walked with you, and he was not for you took him (Gen. 5:24). Noah walked with you – a righteous man, blameless in his time (Gen. 6:9). You declare to Abraham: “I am God Almighty; walk before me and be blameless” (Gen. 17:1). Lord, you test your people on whether they will walk in your instruction (Manna- Exodus 16:4). You’re a God who breaks the bars of our ‘other’ yokes so that we may walk erect. (Lev. 26:13). You walked in the midst of the camp of the journeying Israelites to deliver them and defeat their enemies for them (Deut. 23:14). Your walking among your people is an impetus for living a life that pleases You. You warned your people of old that if you saw anything indecent among them, you would turn away from them (Deut. 23:14). Let us so cherish Your presence among us that we turn away our eyes from worthless things or anything that would supplant You from the place of supremacy in our hearts. When we walk through the valley of the shadow of death, we don’t fear any evil for You are a shepherd who walks with and before your people (Psalm 23:4)! We are those who naturally walk (conduct our lives) in darkness (Isaiah 9:2) due to our sin and its attendant consequences. Grant us Lord, the grace to heed the invitation to: “Come, house of Jacob, and let us walk in the light of the Lord.” (Isaiah 2:5). Thank you for giving us your Spirit to speak to us, and show us how and where to walk. “Your ears will hear a word behind you, ‘this is the way, walk in it,’ whenever you turn to the right or to the left” (Is. 30:21). The redeemed of the Lord are those who walk on “the highway of holiness (Is. 35:8)… This points forward to the return from exile… joyful shouting… everlasting joy… with sorrow and sighing fleeing away. Lord, show me how to wait and hope for you…. Give me that new strength. I want to mount up like an eagle. Grant renewed strength so that I can run and not become exhausted. You say that you renew Your people in such a way that they will walk and not become weary (Isaiah 40:31). Thank you, Lord, for being a God who promises to be with us when we pass through the waters and flooding rivers. When we walk through the fire, we will not be scorched, nor will the flames burn us (Is. 43:2). At times when we walk in darkness, and do not have the light of your guidance and do not sense the light of your presence, we must trust in the name of the LORD and rely upon our God (Isaiah 50:10). How often I have walked in the way that is not good—following my own thoughts. Thank you Father, for persisting in sparing not Your hands to welcome a rebellious person like me (Is. 65:2). How easy it is to walk after and pursue those things that do not profit spiritually and eternally (Jer. 2:8). We have walked after emptiness and have become empty (Jer. 2:5). Like your people of old, there is something in my heart that resists walking in the ancient paths… paths that Jeremiah says that lead to finding rest for my soul (Jer. 6:16). Your Word declares that when I persist in walking after other gods (idols), it leads to personal ruin. The number one problem that keeps me from walking with you is that I walk after the stubbornness of my own heart. (Jer. 9:14; 13:10; 16:12; 23:17). Lord, you continue to remind us what is good and what the Lord requires of us… to love kindness, to do justly (justice) and to walk humbly with You our God (Micah 6:8). According to the promise of Jesus: If we follow Him, we will not walk in darkness because we will have the light of life (Jn. 8:12). Lord, give me grace today to walk in newness of life (Rom. 6:4)… to walk by faith and not by sight (2 Cor. 5:7)… to walk by the Spirit (Gal. 5:16)… to walk in the good works that You have prepared in advance for us to do (Eph. 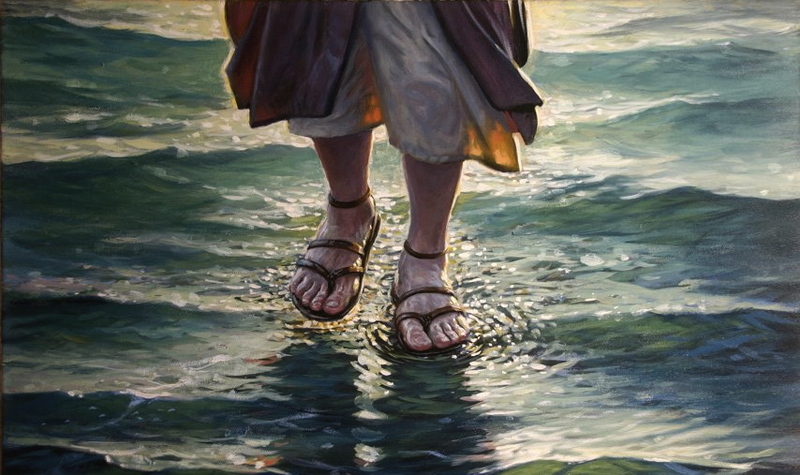 2:10)… to walk in a manner worthy of the gospel (4:1)… to walk in love (5:2)… walk as children of light (5:8)… exercise care in how we walk so that we walk wisely (5:15)… to walk as Jesus walked (Col. 2:6 & 1 Jn. 2:6)… to walk in the light (1 John 1:7). Lord, grant us the great joy of seeing our own children walking in the truth (3 John 4). You are the one who walks among your lampstands… your churches (Rev. 2:7). May we be found faithful to the end… walking in your ways and your truth. At the end, we and all nations shall walk by the light of Your glory that illumines the heavenly city (Rev. 21:24). Maranatha! Come O Lord and walk among us. Be our God and take us to be your people. A great devotional. Love you.